NEW 1oz. dropper!!! Twice the Size. Are you dealing with antiaging issues AND have the oily skin of a 16 year old? Large pores? We can tackle several issues simultaneously with our mattifying & tightening serum. 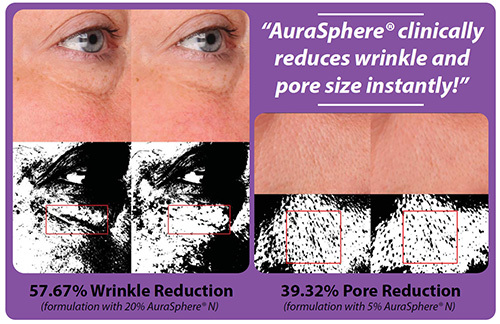 Learn how to get the - instant tightening face-lift-in-a-jar effect you are looking for with our new Aura Smooth Xpress. Optical blurring of fine lines. Simple to use, just mix this into your favorite cream or use alone for intense strength. Dealing with OILY skin every day? 1 pump of this on your T-Zone will keep that shine in check! Use every day on top of your moisturizer to control oil. To learn more, see great pictures and understand the science behind our amazing product, continue reading below. Instant optical blurring of lines, wrinkles & pores. Minimize wrinkles quickly, painlessly and effectively. Tightening and mattifying instantly and progressively! Broad spectrum wrinkle minimizers, work synergistically to create an intense and immediate tightening and mattifying effect. Smooth your micro relief, reduce roughness, mattify shine, minimize pores and blur fine lines. For use on the face, hands and arms. You will get approximately 70-75 applications with this syringe. Based on the development of edible film used in the food industry, a polymer matrix has been created that is ideally adapted to the requirement of a skin tightening ingredient. Liftonin(R)-Xpress is based on renewable materials such as Cellulose derivatives and maltotriose polysaccharides. Embedded within it is a lyophilisate made from red micro algea. The physical tightening effect is intense, immediately noticeable and last for several hours. Various types of wrinkles are visibly and measurably minimized. Liftonin(R)-Xpress smoothes the area around the eyes by up to 74% within one hour! Up to 74% reduction of lines around the eye area - within 1 hour. 20 test subject (average age 51) applied a serum containing 1% Liftonin(R)-Xpress and wrinkle depth was measured before and 1 hour after the application. See below. Using Liftonin(R)-Xpress on the body. Back of hands and arm study. 20 female test subjects (ages between 35-60 years) with a 1% formulation applied. Roughness measured before and 30 minutes after application. AuraSphere(R) is an aqueous complex developed from the technology behind Penstia(tm) Powder. The technology provides unique visual and tactile properties. It works to instantly minimize the appearance of lines and wrinkles, while providing a soft, comfortable film. When applied to the skin, a matte finish is immediately noticeable. The result is a smooth, silky film, which makes the skin appear virtually free of fine lines. AuraSphere(R)'s small particle size provides an even, natural coverage, with a light feel. All pictures, graphs and studies courtesy of Centerchem, INC - AuraSphere(R) and Rahn Group - Liftonin(R)-Xpress. Apply Serum as needed to smooth expression wrinkles. Remove clear overhead cap so silicone tip is exposed. Unlock Aura Smooth Xpress syringe by twisting the white tube counter-clockwise. Disperse 1 pump of product onto fingertips by depressing the white plunger. Gently apply serum to target areas with a light patting or smoothing motion. Around the eye area, Forehead, Nasal labial folds, where needed. Allow product to dry. Follow with moisturizer.To avoid accidental product loss, twist tube clockwise to Lock syringe. Alternate method #1: Mix 1 pump Aura Smooth Xpress with your favorite cream in your hand. Mix together and apply to entire face and neck. Alternate method #2: Apply on top of makeup/moisturizer to oily areas to promote a matte finish. To avoid accidental product loss, twist tube clockwise to Lock syringe. Apply over cap and store in a cool dry location.